I started making signs about 25 years ago after seeing an old timer paint the name on a fishing boat I was working on. I had always liked working with my hands and the hand eye skills it required were a constant challenge. I became intensely driven to hone my lettering and carving skills. As my business, Keene Signworx grew and the reality of deadlines grew the hand carving especially became a chore. Eventually the challenge of creating a dimensional sign by hand was gone and it was just routine work in the shop. The real fun is always with the design, but that is a subject for another time. After being involved with starting a brew pub and learning from all the planning it took I decided to take a fresh look at my sign business to design in effeciencies that would seed up production without adding to the staff, (all two of us). The first time I saw a CNC router running I knew I had to have one. I couldn't believe the speed and accuracy these machines. It could carve out a line of lettering in two minutes that would take a fast carver two hours! This was 1996 and there were very few of these machines around and almost non in sign shops. It took me about 6 months of research and soul searching before taking the plunge. 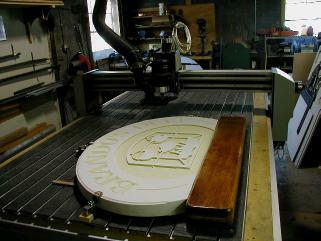 A CNC router is a computer driven three axis motion control table with a high speed router head. It will move in any of the three dimensions at the same time however the software tells it to. In the case of my Precix 9100 it has servo control linear motion motors which are very fast, very smooth and very accurate. The commands come from a "toolpathing" software in NC code which the computer on the router reads. Once you are confident with the process and software the fixturing of material and tool choice become the big challenge. In this case it puts the power of advanced manufacturing in the hands of a small time artisan. I got a day of training with the purchase of the router and my mind wasn't in it because my old friend Nanook had died the night before. She had been my constant companion for 14 years, guard of the sign shop and ran with me daily for most of those years. The day after John the trainer left I went in and ran everything I could remember from the day before and then some. Buy the end of the second day I had figured out how to make that machine do things that Precix didn't think of. The beauty of the machine for my shop was that its speed would now make techniques possible that were just to expensive to sell if you were doing them by hand. Now my imagination was free to create without having to worry about the labor involved, (or not so much anyway). Eventually I was hired by Precix to travel to trade shows and give demos on the machine. It was a turning point for us and we have been cranking out first rate wildly creative signs ever since.